Congrats to Breaking Bad on winning Five Emmy awards! Congrats to Breaking Bad on winning five Emmy awards last night. Bryan Cranston won the award for best lead actor in a drama series, outstanding supporting actor in a drama series went to Aaron Paul. Anna Gunn won the award for outstanding supporting actress and the show won outstanding drama series and outstanding writing for a drama series! Gus Fring Burned Face Action Figure – Relive the memorable season finale of Season 4 of Breaking Bad with this Breaking Bad Gus Fring Burned Face Action Figure – Entertainment Earth Exclusive! Gus Fring, the ruthless drug kingpin with the mild mannered, respectable exterior gets half of his face blown off by a bomb. Gus Fring is wearing his black and blue suit as seen in the episode, and is in the process of adjusting his tie. This Exclusive Gus Fring Action Figure also comes with a special slip case packaging. Gus Fring looks all nice and dapper, but as you slide the slip cover down, poor Gus is shown with his half his face burned. 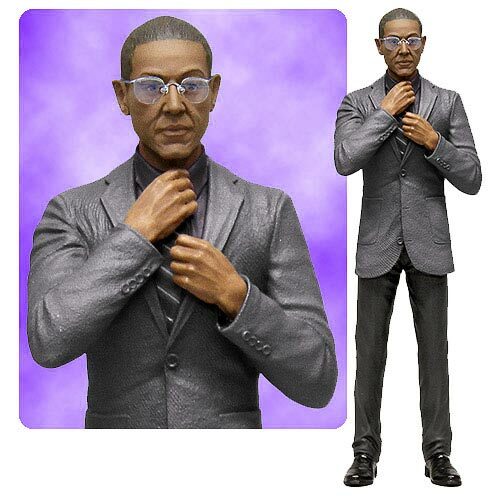 A fan favorite, this 6-inch scale Gustavo Fring Action Figure wears one of his trademark suits and his ever-present glasses are removable. Dapper yet subdued, he appears harmless, but make no mistake, ice water flows through his veins and he can kill you without hesitation if you stand in his way. Click here or below to pre-order this figure from Entertainment Earth. Breaking Bad Gus Fring 6-Inch Action Figure – Gus Fring, the ruthless drug kingpin with the mild mannered, respectable exterior now joins the lineup of Breaking Bad figures. A fan favorite, this 6-inch scale Gustavo Fring Action Figure wears one of his trademark suits and his ever-present glasses are removable. Dapper yet subdued, he appears harmless, but make no mistake, ice water flows through his veins and he can kill you without hesitation if you stand in his way. In addition to his removable glasses, he comes complete with a scale bucket of Los Pollos Hermanos fry batter and comes on a display friendly blister card. Click here or below to pre-order.